Britain's George Groves says his WBC eliminator against Christopher Rebrasse on Saturday has more significance than his record-breaking bout against Carl Froch at Wembley in May. The 26-year-old was beaten to the WBA and IBF world super-middleweight titles by Froch in front of 80,000 fans. And as he prepares to face France's Rebrasse at Wembley Arena, he also hinted at a re-match with rival Froch. "This is more important than any other fight I've had," he said of Rebrasse. "I lost my last fight and if I lose this one there will be some serious things that need addressing," Groves told BBC Sport. Groves also lost to Froch prior to the Wembley bout when he was controversially stopped by the referee in Manchester last November. Should he beat Rebrasse to the European title, he would face American Anthony Dirrell for the WBC belt and he hopes he can become world champion by the end of the year. Groves, who has won 19 of his 21 fights, with 15 knockouts, has previously held the British and Commonwealth titles. Meanwhile Rebrasse, 32, has lost twice in 27 fights with only six of his wins coming inside the distance. 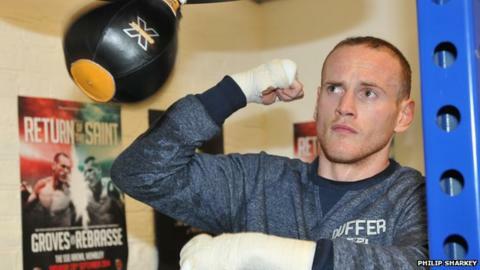 Despite being knocked out in the eighth round of his contest with Froch, Groves says his confidence has not been dented and he wants a re-match with his arch rival or fellow British super-middleweight James DeGale, who he beat to the British title in 2011. "If I take anything away from those last two fights, it is that I belong at that level. I had the beating of Carl in both fights and was a little bit unlucky," Groves added. "Full credit to him for getting the punch off but up until that point I felt like we were in control. "Certainly, there will be a temptation there to fight me because he does not like me. The first interview he gave after the fight, he told me to crawl back into the hole where I came from and he has taken swipes at me ever since. "For a man who has won two fights, he should not be so bitter and have so much contempt towards me. For whatever reason, he's struggling with the win. "If I can get through this fight with no injuries, then maybe we can get a fight before Christmas and start the New Year as the WBC champion, but Saturday comes first. "Then if we win the WBC belt, you could be talking about a unification fight against Froch or DeGale, if DeGale picks up the IBF title. "I look forward to both fights. I've performed well when I've faced them before and I know I can do better." Froch v Groves: Who will win?